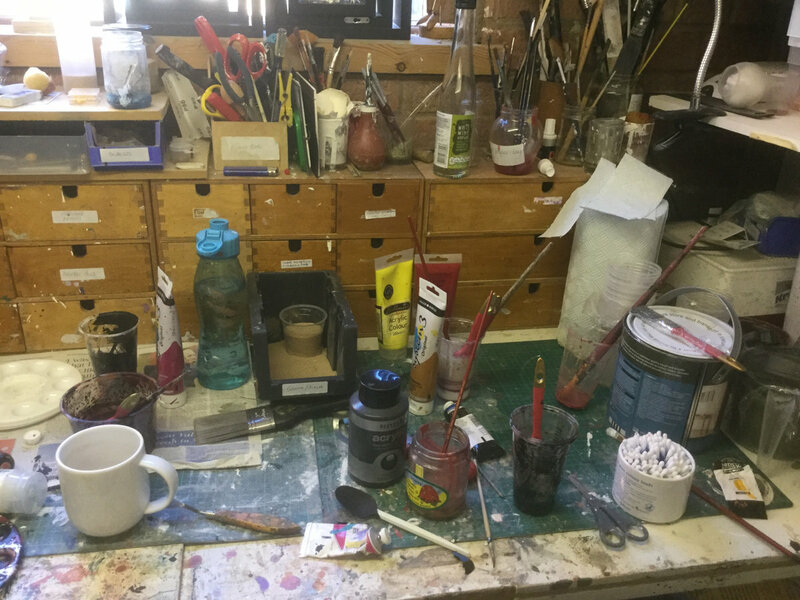 There is always a frenzied work period prior to an exhibition, always my favorite time, deep in the flow of creation, and a whole mess in the studio, I don’t clean up, until I complete a process. If my studio is tidy, it means i’m about to embark on new work. After an exhibition I clean down the decks, ready to start again. I am on the final track, after lots of ups and downs, and it is quite scary to think that you will be losing something that you have obsessed about for a period of time. This body of work has grown from raw materials, wood, screws, glue, primer, pigment, varnish, dutch metal(schlag). I have repainted my under painting and gilding twice, lots of time waiting for process to dry, and worst of all, leaving to get your eyes reset from looking at the work too long. The panels are now in my sitting room, so that I can get new perspective on them. Still finessing and touching up. Image is quite dull but gives an idea.